It is 2:00 in the morning and most of our men are asleep in their dugouts -- yet I could not sleep myself before writing to you of the wonderful events of Christmas Eve. In truth, what happened seems almost like a fairy tale, and if I hadn't been through it myself, I would scarce believe it. Just imagine: While you and the family sang carols before the fire there in London, I did the same with enemy soldiers here on the battlefields of France! 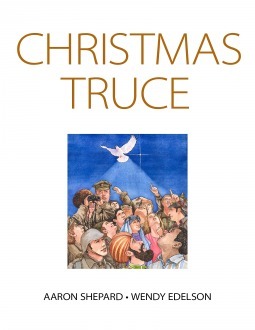 The Christmas Truce of 1914 is one of the most extraordinary incidents not only of World War I but of all military history. Providing inspiration for songs, books, plays, and movies, it has endured as an archetypal image of peace. Yet much about the historic event remains shrouded in myth and legend. In this fictional letter -- illustrated in authentic detail by Wendy Edelson -- award-winning author Aaron Shepard draws from firsthand accounts of soldiers at the front to portray the truce in its true nature and spirit. Review: I first decided to read this book because the Christmas season is almost upon us (despite what most retail stores would have us believe). I've heard about the truce before, and was genuinely curious to see this interpretation of it. The story and images are very powerful, and a timely read, especially with the unrest within many countries and the various wars and militant attacks going on all over the world. Perhaps if we can all realize we're not all that different after all underneath our skin color, the world could find some peace.